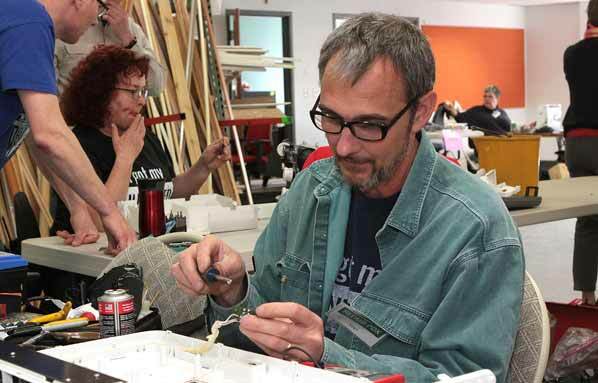 At this outer East Portland Repair PDX “Repair Café”, volunteer Stan Jones works to fix a fan motor controller. An organization called Repair PDX has held “repair salons” with other events, such as the Fix-it Fairs, held every year in Parkrose and Powellhurst-Gilbert neighborhoods. But in the Habitat for Humanity ReStore, situated under Plaza 205, the organization held a free-standing “Repair Café” on April 30. One of the organizers of Repair PDX, Lauren Gross, says she enjoys her part-time volunteer position with the organization. 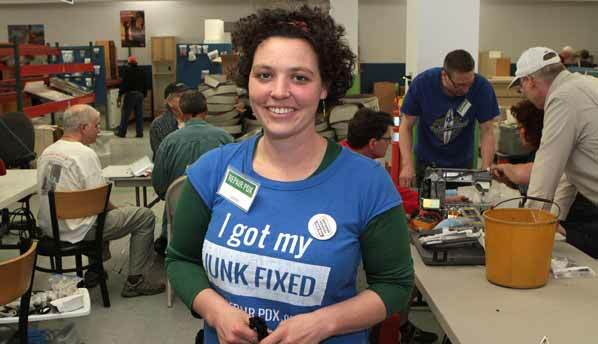 “Repair PDX organizes free events where volunteers come to get their broken items fixed,” explained one of the event’s organizers, Lauren Gross. Gross said she helped start the organization in May, 2013, after living in the Netherlands, and seeing a group there holding what they called Repair Cafés back in 2008. 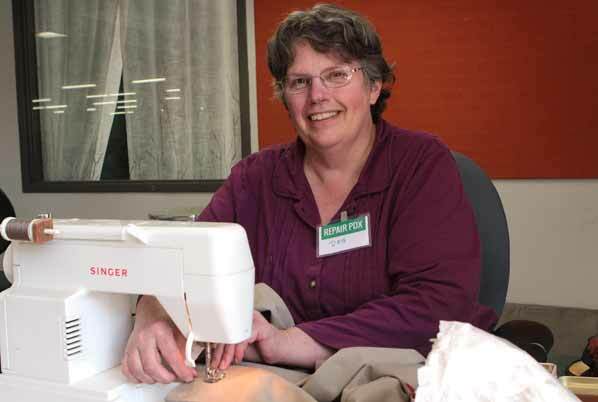 Volunteer Debora Johnson helps a “customer” by mending a jacket on her sewing machine. Volunteering with Repair PDX is important to her, Gross said, because it helps us more highly value what materials and resources that we have. In total, there are about 85 people who volunteer with the organization, and have all one or more kinds of skills: Sewing, electronics, electrical things. “Generally it’s people who like to tinker – mostly fixing appliances and bicycles,” Gross noted. If you’re interested in fixing things – or just want to know the location and date of the next Repair Café – see their website: CLICK HERE. > On our Front Page: Volunteer Stan Shaw tries to figure out why this sewing machine isn’t working.